An area that's been on the back burner for longer than I'd like, and that is the exchange of curtain panel plates from Grasshopper to Revit (etc etc). Some potential clients evaluating the tools for this purpose led me to implementing some ideas and strategies for this. 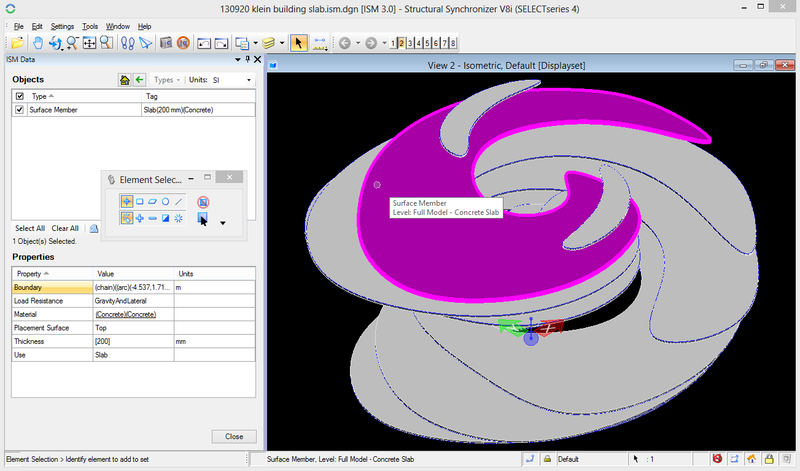 Note that this isn't means to rationalize or divide surfaces into panels (there are other plugins such as paneling tools for this) but as a means to generate the curtain panel plates in Revit having already conducted the paneling process. 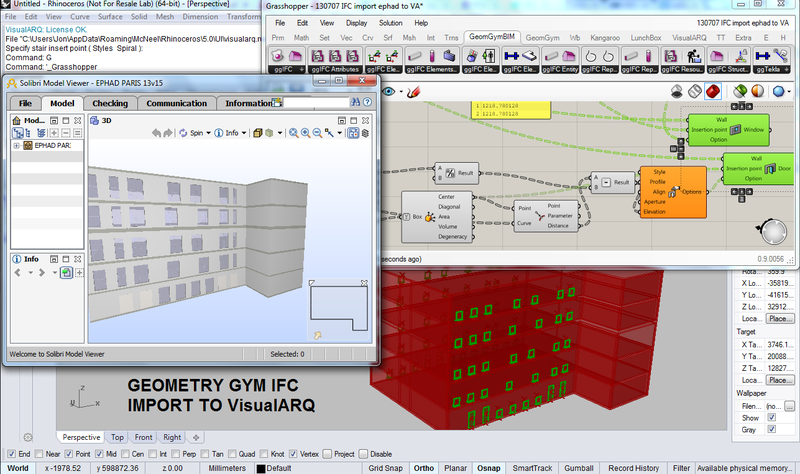 Update to the latest plugins for Rhino and Revit IFC from http://www.geometrygym.com/downloads to test these. I've implemented a means to represent the panels as surface objects (not extruded to thickness). If the perimeter is planar, and has 3, 4 or 5 edges linear edges, then the Revit plugin will initiate an adaptive component family that generates an equivalent object. Material needs to be manually altered in the family if appropriate. Here's a sample GH definition creating a random array of planar panels and here's the generated IFC file. I've also been looking at means to generate non-planar panels. If the panel is an loft from one end curve to the other, then I've implemented a means to again generate a revit equivalent. Here's a sample gh definition and here's the resulting IFC file. I'm also investigating a means to create a non-planar panel with 5 edges. I'd also really like to able to define master "families" of the same shape panels, and then propogate instances in Revit. But the Revit API seems to be lacking fairly fundamental functionality to do this. If you've requests, suggestions or questions, don't hesitate to get in touch. We were lucky to return back to London recently for my brother's wedding. Being August and summer, it was a great time for a wedding but not the ideal time to try and meet lots of existing and potential users of the Geometry Gym tools. I did manage a few meetings and Simply Rhino organized 4 computer lab sessions for those interested to not only view but try hands on application of the tools (This worked quite well and is something I'll look to repeat if I'm visiting other cities). I was asked a few times about model exchange Grasshopper to AECOsim and it's something I've made a start on testing. 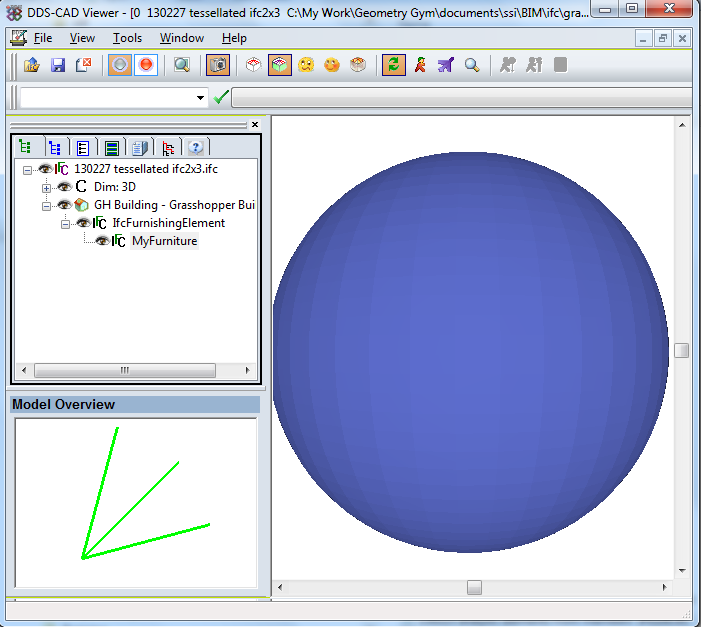 As per all BIM software, they do have IFC coordination import/export, but I've made a start on using the ISM as a basis of generating structural model data from IFC (grasshopper generated or not) into AECOsim and various other software interacting with ISM. Here's some prototype models. Curved members are coming quite well into AECOsim. I tried my klein building slabs and they preview well in ISM viewer, but causes some errors when importing the ISM into AECOsim (Bentley will hopefully advise soon). If you're interested in testing this work flow, please get in touch. Initially this will be structural based but I am keen to enable other disciplines and data if demand is there (ISM has provided a fast means of getting started with a strong overlap of IFC structural data). 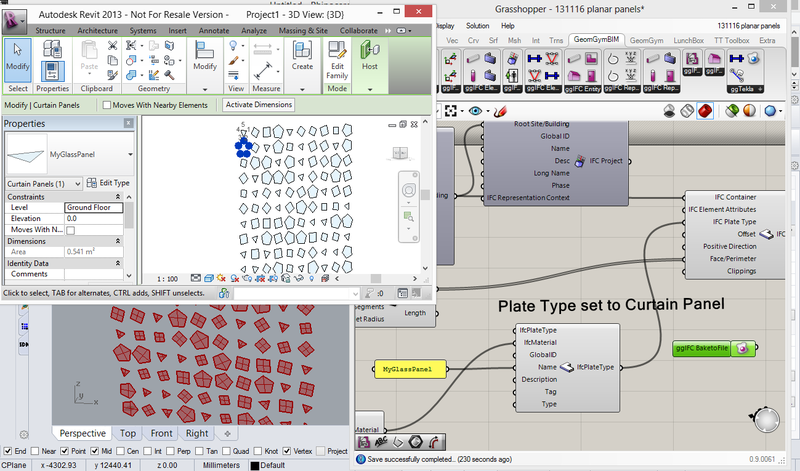 Of course Bentley have Generative Components as a very similar tool to Grasshopper, but freedom to exchange models across platforms can enable very powerful work flows. There's been a few private and public discussions about Parametric IFC and IFC for Content. As a prelude refer to http://mdradvies.blogspot.nl/2013/10/ifc-for-content.html and perhaps we need a twitter hash tag? Manufacturers and suppliers are caught in a difficult situation at the moment about generating BIM data and leveraging the best value (and success) in doing so. 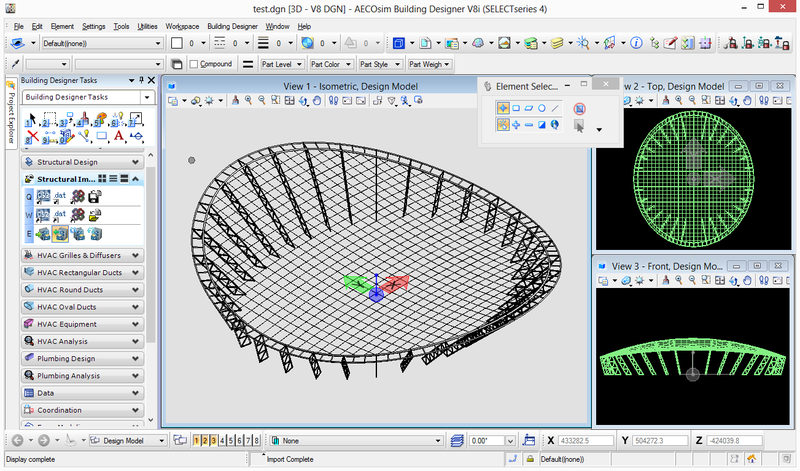 There is obviously a cost in preparation and there is little choice at the moment but to either generate pick which BIM software that native content can be created for or generate IFC as neutral data. Budget, time and expertise constraints make it highly unlikely anyone will author native content for all BIM software (and is a lot of duplicated effort). Current BIM software capability with IFC is presently leads to a lot of frustration and poor performance, but I don't think it has to be that way and will try to convey that with this blog post. Martijn comments that the IFC file has 2640 lines of IFC to define it (actually the version I just downloaded has 2118). The authors at National BIM Library have used the faceted brep shape representation to define the geometry which is pretty typical of IFC files to date. The geometry is effectively meshed into planar faces. When you do this, you loose the parametric and intelligent aspects of the geometry (ie, if I want to now make the flush pipe change diameter, it's a near impossible task to relocate all the vertex accurately into the new positions. Perhaps some manufacturers/suppliers prefer this as it means the content is "protected" but it does come at a cost. I haven't sought permission to "edit" this file (if someone has a problem, let me know), but I substituted the geometry for extruded area solids and swept disk solids which retain parametric geometry. You can download this IFC file here. By replacing the shape representations with more intelligent and accurate shape representations I reduced the file to 357 lines of IFC of which a lot are property values. If you've had bloated IFC files gigabytes in size, a lot of this can be attributed to meshed hand rails and the like (Please request to your BIM software developers to implement and utilize swept disk solids). I actually did simply the shape of the cistern a little, not because IFC isn't capable, but because certification requirements of IFC software do not require the implementation of IfcExtrudedAreaSolidTapered which would more accurately and efficiently the tapered cistern. This would have added about 30 more lines to the IFC file (and I can post if requested). Download the revised file here. In one quick step I changed the 2nd field for radius from 15mm (30mm diam) to 40mm (80mm diameter). 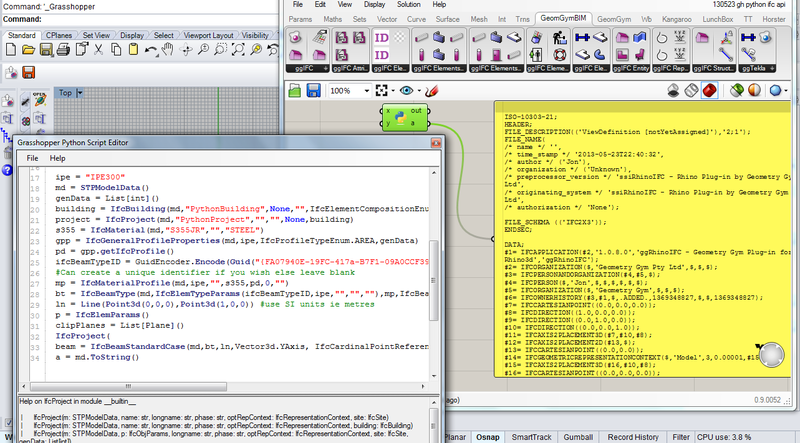 Now, what we really want to do is drive content as we can in Revit (and I understand, GDL in Archicad) from parameters. An IFC pipe segment (or type) can have a property value stored in the common property set for "Nominal Diameter" What would be nice is to change this value (akin to changing a parameter on the family in Revit) and have the geometry and any calculated values update to this change. IFC as presently defined does not have this capability, but there is a very interesting proposed extension for IFC to do just that. http://www.buildingsmart-tech.org/future-extensions/ifc-future-extensions/project-proposals/pa-1-parametric I don't know any software that has implemented it (really users are going to have to demand it) and I thought I'd implement file exporting to demonstrate it. Download the IFC file here. So if you read the IFC, you see I've bound the property single value to the circle hollow profile def radius, with a formula to adjust by a factor of 0.5 (to adjust from diameter to radius). It would be possible to define formula relationships and the like (akin to Revit and to my knowledge GDL) and have them converted from the IFC file into the native equivalents. 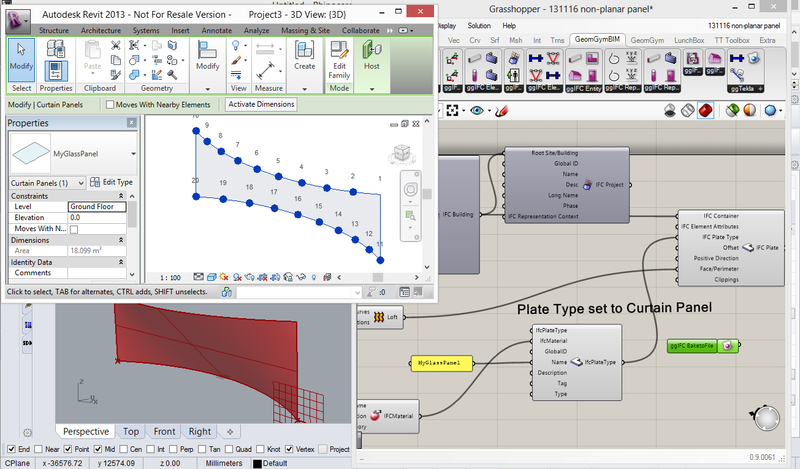 (Grasshopper definition if you want to test, the components are hidden from the menu at this stage). So, if the industry wants to generate more intelligent model content, and use it in a wider variety of software and contexts, it would seem a good idea to get on and implement (and improve) this extension. Note also this extension can provide provision for constraint relationships. To quickly address the comment from Martijn about "IFC is meant for Projects), this is perception rather than technical intention (Refer definition of IfcProject here). IFC4 does improve this situation, where a project can declare "types" without populating an instance of this in space. I state all the time, IFC isn't perfect. But it is capable of a lot more than implementation demonstrates at this point in time. And before we can really work on improving it, we really need to be able to test and utilize what it is already capable of to identify improvements and shortfalls. I look forward to discussing further. SIAL (Spatial information Architecture Laboratory) at RMIT University in Melbourne have been very generous to host an OpenBIM event on the evening of Monday the 18th February. It's a great privilege to announce that Dr Thomas Liebich is also in Melbourne at this time. Thomas is the leader of the IFC Development team for Building Smart International based in Germany, and also a director of AEC3. Thomas will present on the IFC standard (past, current and future) including the imminent release of IFC4 as an ISO standard. I will also present on OpenBIM workflows and the research/development I've done in the past 3 years. 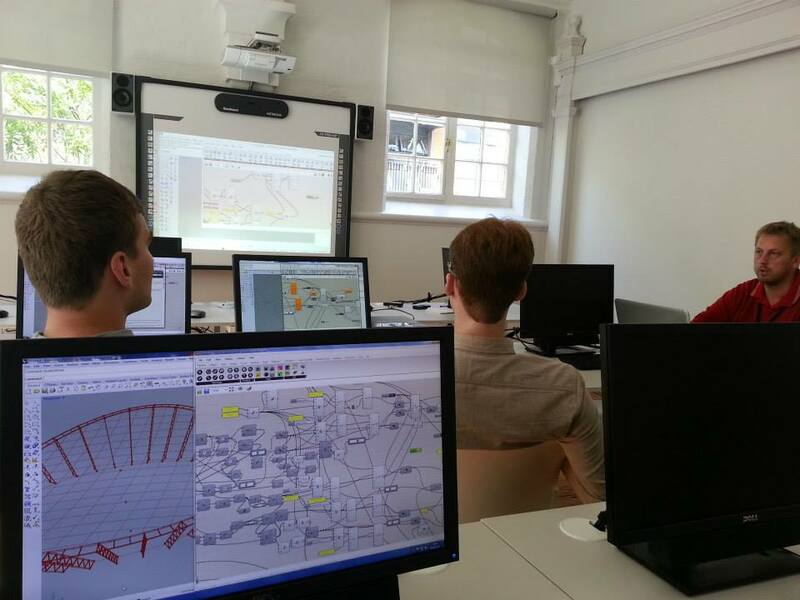 This will include insights into project application of generative BIM workflows from Grasshopper to Revit and Tekla. 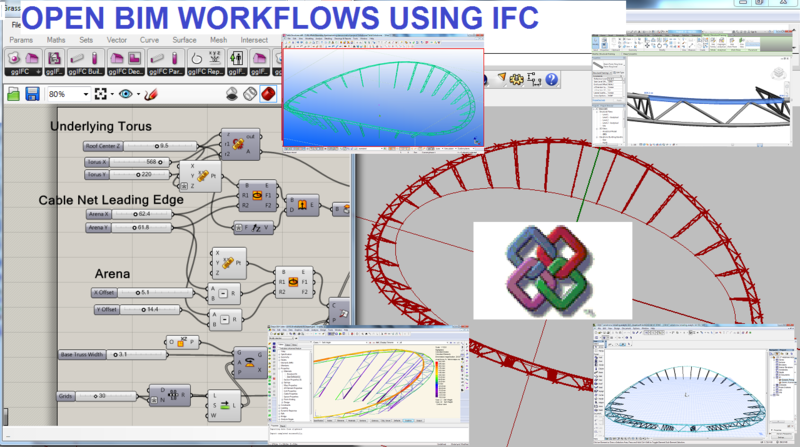 I will also be discussing why current IFC implementations by BIM software vendors have only utilized IFC to a fraction of it's capability and potential. I will also demonstrate benefits design teams can realize from collaboration of model sharing using IFC including Fabrication, Analysis and Design ( Structural, Energy, Egress, Building Regulation compliance), Facility Management etc. Please rsvp if you'd like to attend to jonm@geometrygym.com or contact me for more details. We plan to start presentations at 6pm, but will be there from 5:30pm at the multi-purpose room of the Design Hub (Level 1). Note there will be a second event hosted at Arup on the Wednesday evening. More details to be posted shortly. IFC - What It Is and Why You Should Care? 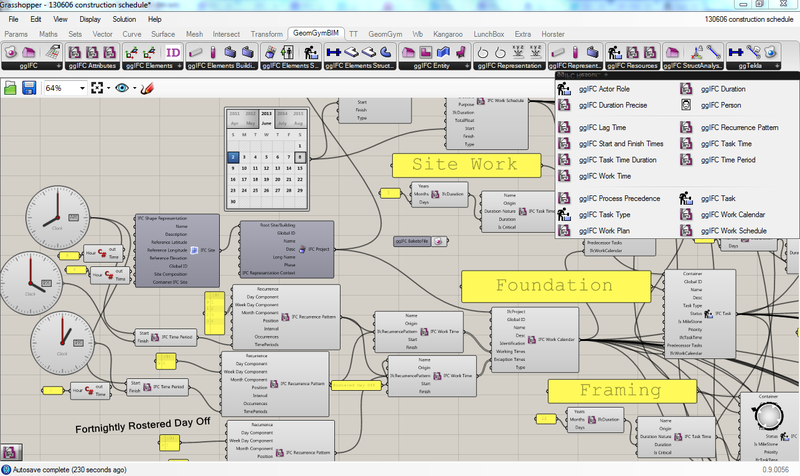 Christopher Zoog of HOK presented this great explanation to the New York City Revit User Group earlier this week. HOK are certainly pushing and pursuing IFC in a number of impressive ways into their workflows, including pressure on software providers (such as myself). They are not alone, but this provides some great insights into what is possible and what will be. Thanks to Ryan Shultz for recording and enabling sharing.